Paganism (from classical Latin pāgānus "rural, rustic", later "civilian"), is a term first used in the fourth century by early Christians for people in the Roman Empire who practiced polytheism. This was either because they were increasingly rural and provincial relative to the Christian population, or because they were not milites Christi (soldiers of Christ). Alternate terms in Christian texts for the same group were hellene, gentile, and heathen. Ritual sacrifice was an integral part of ancient Graeco-Roman religion and was regarded as an indication of whether a person was pagan or Christian. Paganism was originally a pejorative and derogatory term for polytheism, implying its inferiority. 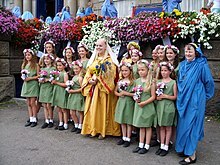 Paganism has broadly connoted the "religion of the peasantry", During and after the Middle Ages, the term paganism was applied to any non-Abrahamic or unfamiliar religion, and the term presumed a belief in false god(s). Most modern pagan religions existing today - Modern Paganism, or Neopaganism - express a world view that is pantheistic, polytheistic or animistic; but some are monotheistic. The origin of the application of the term pagan to polytheism is debated. In the 19th century, paganism was adopted as a self-descriptor by members of various artistic groups inspired by the ancient world. In the 20th century, it came to be applied as a self-descriptor by practitioners of Modern Paganism, Neopagan movements and Polytheistic reconstructionists. 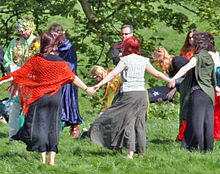 Modern pagan traditions often incorporate beliefs or practices, such as nature worship, that are different from those in the largest world religions. The term pagan is derived from Late Latin paganus, revived during the Renaissance. Itself deriving from classical Latin pagus which originally meant 'region delimited by markers', paganus had also come to mean 'of or relating to the countryside', 'country dweller', 'villager'; by extension, 'rustic', 'unlearned', 'yokel', 'bumpkin'; in Roman military jargon, 'non-combatant', 'civilian', 'unskilled soldier'. It is related to pangere ('to fasten', 'to fix or affix') and ultimately comes from Proto-Indo-European *pag- ('to fix' in the same sense). The adoption of paganus by the Latin Christians as an all-embracing, pejorative term for polytheists represents an unforeseen and singularly long-lasting victory, within a religious group, of a word of Latin slang originally devoid of religious meaning. The evolution occurred only in the Latin west, and in connection with the Latin church. Elsewhere, Hellene or gentile (ethnikos) remained the word for pagan; and paganos continued as a purely secular term, with overtones of the inferior and the commonplace. Medieval writers often assumed that paganus as a religious term was a result of the conversion patterns during the Christianization of Europe, where people in towns and cities were converted more readily than those in remote regions, where old ways lingered. However, this idea has multiple problems. First, the word's usage as a reference to non-Christians pre-dates that period in history. Second, paganism within the Roman Empire centred on cities. The concept of an urban Christianity as opposed to a rural paganism would not have occurred to Romans during Early Christianity. Third, unlike words such as rusticitas, paganus had not yet fully acquired the meanings (of uncultured backwardness) used to explain why it would have been applied to pagans. Paganus acquired its religious connotations by the mid-4th century. As early as the 5th century, paganos was metaphorically used to denote persons outside the bounds of the Christian community. 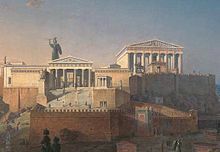 Following the sack of Rome by the Visigoths just over fifteen years after the Christian persecution of paganism under Theodosius I, murmurs began to spread that the old gods had taken greater care of the city than the Christian God. In response, Augustine of Hippo wrote De Civitate Dei Contra Paganos ('The City of God against the Pagans'). In it, he contrasted the fallen "city of Man" to the "city of God" of which all Christians were ultimately citizens. Hence, the foreign invaders were "not of the city" or "rural". The term pagan is not attested in the English language until the 17th century. In addition to infidel and heretic, it was used as one of several pejorative Christian counterparts to gentile (גוי‎ / נכרי‎) as used in Judaism, and to kafir (كافر‎, 'unbeliever') and mushrik (مشرك‎, 'idolater') as in Islam. In the Latin-speaking Western Roman Empire of the newly Christianizing Roman Empire, Koine Greek became associated with the traditional polytheistic religion of Ancient Greece, and regarded as a foreign language (lingua peregrina) in the west. By the latter half of the 4th century in the Greek-speaking Eastern Empire, pagans were—paradoxically—most commonly called Hellenes (Ἕλληνες, lit. 'Greeks'). The word almost entirely ceased being used in a cultural sense. It retained that meaning for roughly the first millennium of Christianity. This was influenced by Christianity's early members, who were Jewish. The Jews of the time distinguished themselves from foreigners according to religion rather than ethno-cultural standards, and early Jewish Christians would have done the same. Because Hellenic culture was the dominant pagan culture in the Roman east, they called pagans Hellenes. Christianity inherited Jewish terminology for non-Jews and adapted it in order to refer to non-Christians with whom they were in contact. This usage is recorded in the New Testament. In the Pauline epistles, Hellene is almost always juxtaposed with Hebrew regardless of actual ethnicities. 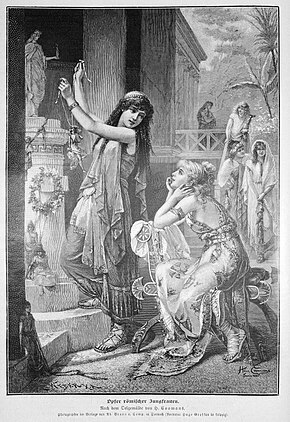 The usage of Hellene as a religious term was initially part of an exclusively Christian nomenclature, but some Pagans began to defiantly call themselves Hellenes. Other pagans even preferred the narrow meaning of the word:from a broad cultural sphere to a more specific religious grouping. However, there were many Christians and pagans alike who strongly objected to the evolution of the terminology. The influential Archbishop of Constantinople Gregory of Nazianzus, for example, took offence at imperial efforts to suppress Hellenic culture (especially concerning spoken and written Greek) and he openly criticized the emperor. The growing religious stigmatization of Hellenism had a chilling effect on Hellenic culture by the late 4th century. By late antiquity, however, it was possible to speak Greek as a primary language while not conceiving of oneself as a Hellene. The long-established use of Greek both in and around the Eastern Roman Empire as a lingua franca ironically allowed it to instead become central in enabling the spread of Christianity—as indicated for example by the use of Greek for the Epistles of Paul. In the first half of the 5th century, Greek was the standard language in which bishops communicated, and the Acta Conciliorum ("Acts of the Church Councils") were recorded originally in Greek and then translated into other languages. Heathen comes from Old English hæðen (not Christian or Jewish); cf. Old Norse heiðinn. This meaning for the term originated from Gothic haiþno (gentile woman) being used to translate Hellene (cf. Mark 7:26) in Wulfila's Bible, the first translation of the Bible into a Germanic language. This may have been influenced by the Greek and Latin terminology of the time used for pagans. If so, it may be derived from Gothic haiþi (dwelling on the heath). However, this is not attested. It may even be a borrowing of Greek ἔθνος (ethnos) via Armenian hethanos. Defining paganism is problematic. Understanding the context of its associated terminology is important. Early Christians referred to the diverse array of cults around them as a single group for reasons of convenience and rhetoric. While paganism generally implies polytheism, the primary distinction between classical pagans and Christians was not one of monotheism versus polytheism. Not all pagans were strictly polytheist. Throughout history, many of them believed in a supreme deity. (However, most such pagans believed in a class of subordinate gods/daimons—see henotheism—or divine emanations.) To Christians, the most important distinction was whether or not someone worshipped the one true God. Those who did not (polytheist, monotheist, or atheist) were outsiders to the Church and thus pagan. Similarly, classical pagans would have found it peculiar to distinguish groups by the number of deities followers venerate. They would have considered the priestly colleges (such as the College of Pontiffs or Epulones) and cult practices more meaningful distinctions. Referring to paganism as pre-Christian indigenous religions is equally untenable. Not all historical pagan traditions were pre-Christian or indigenous to their places of worship. Owing to the history of its nomenclature, paganism traditionally encompasses the collective pre- and non-Christian cultures in and around the classical world; including those of the Greco-Roman, Celtic, Germanic, Slavic tribes. However, modern parlance of folklorists and contemporary pagans in particular has extended the original four millennia scope used by early Christians to include similar religious traditions stretching far into prehistory. Paganism came to be equated by Christians with a sense of hedonism, representing those who are sensual, materialistic, self-indulgent, unconcerned with the future, and uninterested in more mainstream religions. Pagans were usually described within this worldly stereotype, especially among those drawing attention to what they perceived as the limitations of paganism. 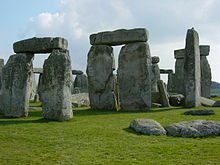 Thus G. K. Chesterton wrote: "The pagan set out, with admirable sense, to enjoy himself. By the end of his civilization he had discovered that a man cannot enjoy himself and continue to enjoy anything else." In sharp contrast, Swinburne the poet would comment on this same theme: "Thou hast conquered, O pale Galilean; the world has grown grey from thy breath; We have drunken of things Lethean, and fed on the fullness of death." Ludwig Feuerbach defined the paganism of classical antiquity, which he termed Heidentum ('heathenry') as "the unity of religion and politics, of spirit and nature, of god and man", qualified by the observation that man in the pagan view is always defined by ethnicity, i.e. Greek, Roman, Egyptian, Jew, etc., so that each pagan tradition is also a national tradition. Modern historians define paganism instead as the aggregate of cult acts, set within a civic rather than a national context, without a written creed or sense of orthodoxy. The developments in the religious thought of the far-flung Roman Empire during Late Antiquity needs to be addressed separately, because this is the context in which Early Christianity itself developed as one of several monotheistic cults, and it was in this period that the concept of pagan developed in the first place. As Christianity emerged from Second Temple Judaism (or Hellenistic Judaism), it stood in competition with other religions advocating pagan monotheism, including the cult of Dionysus, Neoplatonism, Mithraism, Gnosticism, and Manichaeanism. Dionysus in particular exhibits significant parallels with Christ, so that numerous scholars have concluded that the recasting of Jesus the wandering rabbi into the image of Christ the Logos, the divine saviour, reflects the cult of Dionysus directly. They point to the symbolism of wine and the importance it held in the mythology surrounding both Dionysus and Jesus Christ; Wick argues that the use of wine symbolism in the Gospel of John, including the story of the Marriage at Cana at which Jesus turns water into wine, was intended to show Jesus as superior to Dionysus. The scene in The Bacchae wherein Dionysus appears before King Pentheus on charges of claiming divinity is compared to the New Testament scene of Jesus being interrogated by Pontius Pilate. Arabic paganism gradually disappeared during Muhammad's era through Islamization. The sacred months of the Arab pagans were the 1st, 7th, 11th and 12th months of the Islamic calendar. After Muhammad had conquered Mecca he set out to convert the pagans. One of the last military campaigns that Muhammad ordered against the Arab pagans was the Demolition of Dhul Khalasa. It occurred in April and May 632 AD, in 10AH of the Islamic Calendar. Dhul Khalasa is referred to as both an idol and a temple, and it was known by some as the Ka'ba of Yemen, built and worshipped by pagan tribes. Interest in pagan traditions was first revived during the Renaissance, when Renaissance magic was practiced as a revival of Greco-Roman magic. In the 17th century, the description of paganism turned from the theological aspect to the ethnological one, and religions began to be understood as a part of the ethnic identities of peoples, and the study of the religions of so-called primitive peoples triggered questions as to the ultimate historical origin of religion. Thus, Nicolas Fabri de Peiresc saw the pagan religions of Africa of his day as relics that were in principle capable of shedding light on the historical paganism of Classical Antiquity. The 19th century also saw much scholarly interest in the reconstruction of pagan mythology from folklore or fairy tales. This was notably attempted by the Brothers Grimm, especially Jacob Grimm in his Teutonic Mythology, and Elias Lönnrot with the compilation of the Kalevala. The work of the Brothers Grimm influenced other collectors, both inspiring them to collect tales and leading them to similarly believe that the fairy tales of a country were particularly representative of it, to the neglect of cross-cultural influence. Among those influenced were the Russian Alexander Afanasyev, the Norwegians Peter Christen Asbjørnsen and Jørgen Moe, and the Englishman Joseph Jacobs. However, there often exists a distinction or separation between some polytheistic reconstructionists such as Hellenism and revivalist Neopagans like Wiccans. The divide is over numerous issues such as the importance of accurate orthopraxy according to ancient sources available, the use and concept of magic, which calendar to use and which holidays to observe, as well as the use of the term pagan itself. Many of the revivals, Wicca and Neo-Druidism in particular, have their roots in 19th century Romanticism and retain noticeable elements of occultism or Theosophy that were current then, setting them apart from historical rural (paganus) folk religion. Most modern pagans, however, believe in the divine character of the natural world and paganism is often described as an Earth religion. There are a number of neopagan authors who have examined the relation of the 20th-century movements of polytheistic revival with historical polytheism on one hand and contemporary traditions of folk religion on the other. Isaac Bonewits introduced a terminology to make this distinction. A movement by modern people to revive nature-revering/living, pre-Christian religions or other nature-based spiritual paths, frequently also incorporating contemporary liberal values at odds with ancient paganism. This definition may include groups such as Wicca, Neo-Druidism, Heathenry, and Slavic Native Faith. Sacred feminine: Pagan religions recognize the female divine principle, identified as the Goddess (as opposed to individual goddesses) beside or in place of the male divine principle as expressed in the Abrahamic God. In modern times, Heathen and Heathenry are increasingly used to refer to those branches of neopaganism inspired by the pre-Christian religions of the Germanic, Scandinavian and Anglo-Saxon peoples. In Iceland, the members of Ásatrúarfélagið account for 0.4% of the total population, which is just over a thousand people. In Lithuania, many people practice Romuva, a revived version of the pre-Christian religion of that country. Lithuania was among the last areas of Europe to be Christianized. 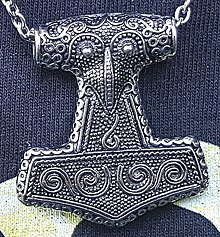 Odinism has been established on a formal basis in Australia since at least the 1930s.